The Preferences Dialog allows the user set certain properties and preferences that are globally adopted by the application and used by all the Documents opened or to be opened. The Preferences Dialog is organized in Tabs allowing modify the properties or preferences by meaningful groups. 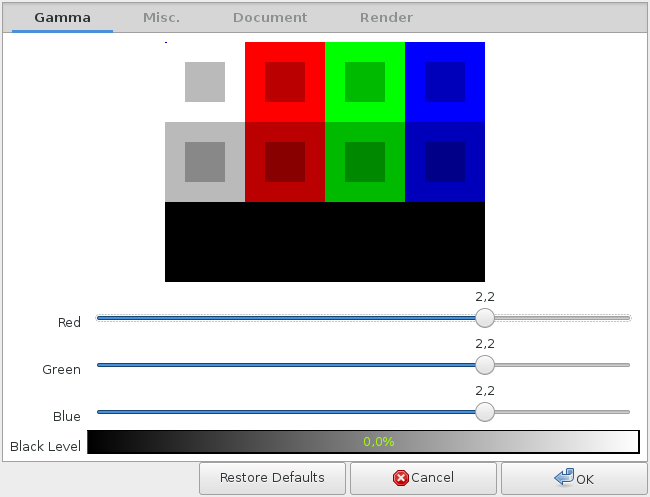 The gamma tab controls how the color representation in Synfig Studio is managed while editing a Document. There is a gamma pattern diagram on the top to let the user visually know how the gamma modifications would look in the color space. This spin button entry box allows the user to define how many recent files are shown when the Toolbox>File>Recent Files menu option is selected. Maximum value is set to 50 and minimum to 1. Default is 25. 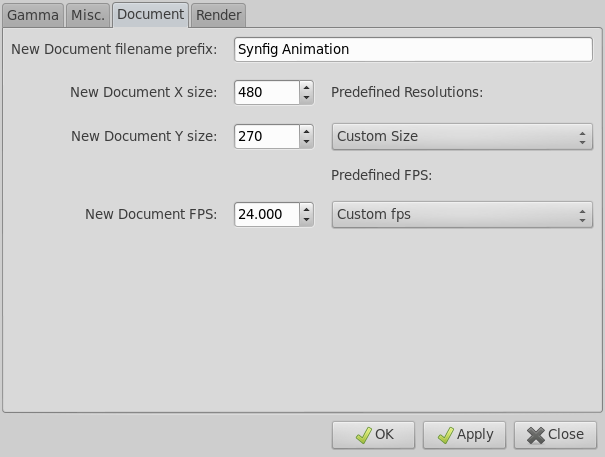 Synfig studio may crash (an infrequent thing lately), or you may have lost power or killed the program for any reason. Synfig Studio does a security copy of the current working document and would ask to recover it the next time you run the program. It can be set to a minimum of 1 second and does not have a maximum. Set it to 0s to disable the automatic backup. Default value is 3m. When you import images, check this option if you want they fit the Canvas size. 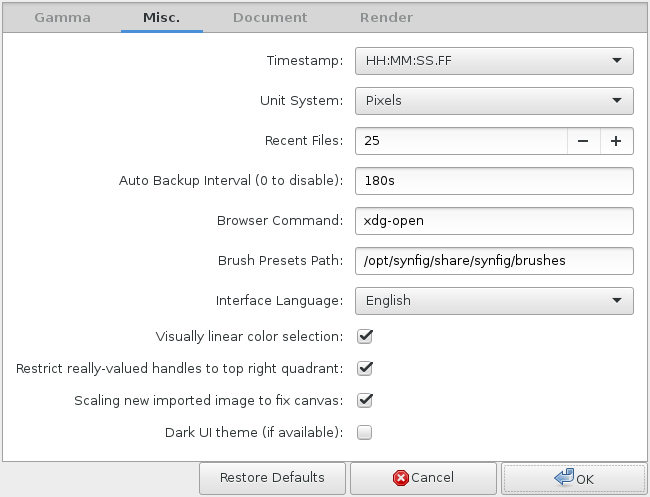 Synfig is shipped with two user interface theme : a light and a dark one. By default, the light one is used, if you want to switch to the dark one, just check "Use dark UI theme"
This tab groups some Document global preferences for the application. All of them would affect new files opened or created after they have been changed. In those spin buttons entries you can set the preferred X and Y dimensions in pixels of newly created documents. This is useful if you're working with a certain resolution and want to keep all the file exactly the same without the tedious task of editing the particular dimensions of each newly created file. Image Area (in units) are calculated accordingly to the correspondence between pixels and units (60 pixels = 1 unit). Default values are X=480 and Y=270 pixels. In this spin buttons entry you can set the preferred frames per second of newly created documents. There is also a drop down list of predefined resolutions according to the standards of the digital industry. 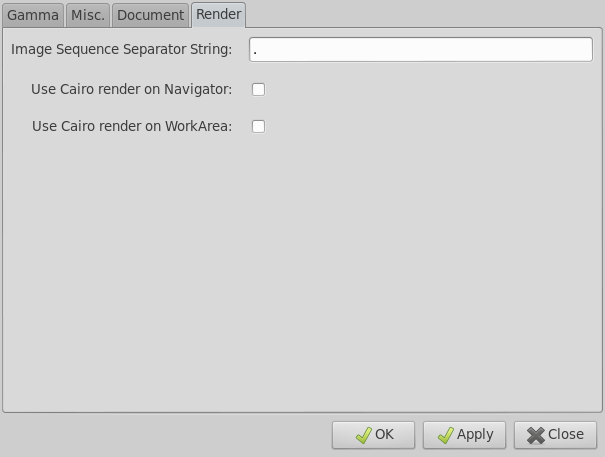 When checked, the Cairo renderer is used in the Navigator Panel. When checked, the Cairo renderer is used in the WorkArea and so in the Canvas. This page was last modified on 17 December 2015, at 18:21.